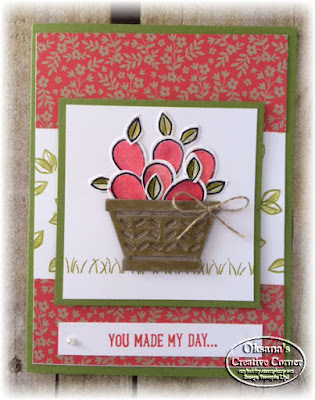 I have a card today to share using Basket Bunch bundle. Even so it is listed as Easter set, it has so much more potential. Stamp smaller egg and leaf image several times in black archival ink on a scrap piece of whisper white paper. Using Watermelon Wonder ink and aqua painter – color the eggs to create apples. Do the same with leafs using Old Olive ink. Die cut with thinlits. Die cut 2 different basket shapes from Tip Tap Taupe. Stamp a grass in old olive on 3 x 3 piece of whisper white. Adhere to old olive piece. Add apples and leaves to the top. Adhere the basket shape (the one with the holes) on top of solid basket. Adhere basket with dimensionals over the apples. Set aside. Randomly stamp leaves in old olive in a center part of 4 x 5 ¼ piece of whisper white. Lightly color them with aqua painter and old olive ink. Adhere designer paper to the top and bottom of whisper white piece. Stamp sentiment on whisper white strip in Watermelon wonder ink. Adhere to the bottom of the card. Embellish with pearls. Tie a bow from linen thread and add to the basket with glue dot.